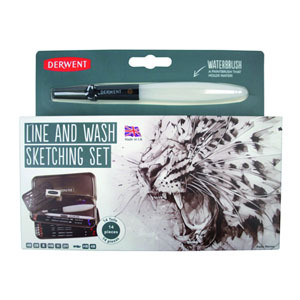 Derwent Line & Wash Sketching Set is the excellent value for money artist quality set. All your line & wash sketching needs can be found in this excellent value for money artist quality set. A wealth of Accessories: Eraser, Pencil Sharpener, Paper Stump for blending, Eraser shield for accurate erasing and shape highlighting, plus a Derwent Waterbrush to make a splash on your work. All this comes in a double layer cool silver tin. The Derwent Line & Wash Sketching Set is the perfect set for college, art classes, or to take with you when you are on the go and out sketching.